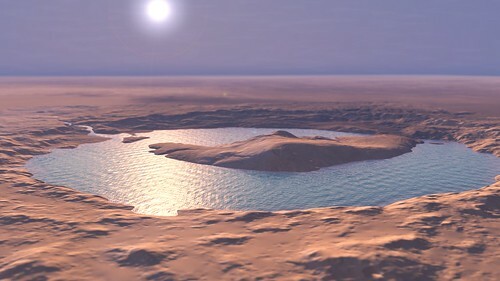 A rerendering of a previous image showing a water filled Gale Crater on Mars (current location of MSL Curiosity). Mount Sharp pokes up in the center. Elevations are exaggerated by several times. Updated with improved vector displacement, water shaders, etc. Rendered using Autodesk Maya and Adobe Photoshop using Mars Express imagery and altimetry, with horizon imagery derived from Viking data.